Mapflare News gives you an overview about international, national und local headlines. Included are those news articles from many sources, which are reporting on a specific location on earth. The headlines are shown on a world map at their assigned location, staggered by their popularity and topicality. If you zoom out of the map, only the most important headlines are shown. Zoom in to a specific region to show additional news from that region. 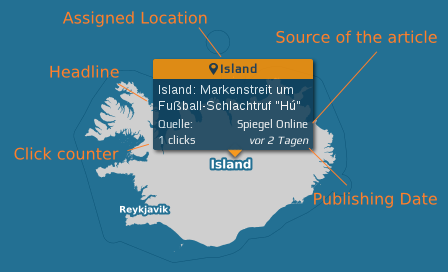 The assignment between news articles and locations is automatically established by a computer program from Mapflare and is not provided by the publishers of the news articles. Erroneous assignments are the responsibility of Mapflare only. If you click on the location name at the top a list with additional news about the location will be shown.